The pace and scale of digital business innovation is increasing. Organizations are trying to optimize resources, speed development, and adapt faster to market changes. 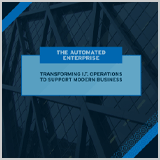 However, this places an extra burden on IT operations teams, who are now asked to move faster, yet manage increasingly complex IT environments. Automation can help. Read this e-book to learn more. Learn how object storage is the right path for the future of backup and enterprise storage.